The Appalachian Mountains are a vast system of North American mountain ranges. They lie partly in Canada, but mostly in the United States, forming a zone, from 150-500 kilometers (approx. 90 to 300 miles) wide, running 2,400 km (1,500 miles) south and westward from Newfoundland and Labrador in Canada to central Alabama in the United States, with foothills in northeastern Mississippi. The northernmost mainland portion ends at Quebec's Gaspé Peninsula. The Appalachians are some of the oldest mountains on the planet, predating the formation of the North American continent. The mountain chain system is divided into a series of ranges, with the individual mountains averaging a height of 900 m (3,000 feet). The highest of the group is Mt. 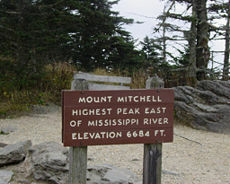 Mitchell in North Carolina at 2,037 m (6,684 feet), which is the highest point in the United States east of the Mississippi River, as well as in all of eastern North America. The term Appalachia is used to refer to different regions associated with the mountain range. Most broadly, it refers to the entire mountain range with its surrounding hills and the dissected plateau region. However, the term is often used more restrictively to refer to regions in the central and southern Appalachian Mountains, usually including areas in the states of Kentucky, North Carolina, Tennessee, Virginia, and West Virginia, and sometimes extending as far south as northern Georgia and western South Carolina, as far north as Pennsylvania, and as far west as southeastern Ohio. In this sense, it has also come to denote in the common mind a region that is economically underdeveloped and has received considerable federal government funding. The Appalachians have played and important role in the American history. Long a natural barrier to westward expansion of European colonial immigrants, the mountains were a theater of war during the French and Indian War, the American Revolution, and most prominently, the American Civil War. They are known for their ecological diversity and breathtaking natural beauty. The celebrated conservationist John Muir described the North Carolina mountains and canyons as "the finest in America of its kind" and "the face of all Heaven come to earth." The mountain chain is a favorite destination for vacationers. Great Smoky Mountain National Park, on the Tennessee-North Carolina border, is the most visited national park in the nation, with more than nine million annual visitors. The primary standard of the range is with a long A, as "a-puh-LATE-chun." In northern parts of the mountain range, it is pronounced "appal-ay-shuhn." An alternative pronunciation, with a short A ("a-puh-LATCH-un") is often used east of the range in the Piedmont region of the Carolinas. The short-A pronunciation is used when referring to Appalachian State University in North Carolina. It turns out that the short-A version, used by a minority, is arguably the correct way to say it. When the Spanish explorer Álvar Núñez Cabeza de Vaca and his crew were exploring the Florida coast in 1528, they found a Native American town with a name they transliterated as Apalachen ("ah-pah-LAH-chen"). This name and its short-A pronunciation were applied to a nearby body of water, now spelled Apalachee Bay, to the Apalachicola River and Apalachicola Bay, and to the town known as Apalachicola, Florida. The word "Apalachen" was also applied to an inland mountain range, and through the course of time it became applied to the entire range and its spelling was changed. Although the long-A pronunciation for the mountain range is standard, it is at odds with its origin. The whole Appalachian system may be divided into three great sections: The Northern extends from Newfoundland to the Hudson River; the Central, from the Hudson Valley to that of the New River in Virginia and West Virginia; and the Southern, from the New River southward. The best-known ranges of the northern section are the White Mountains in New Hampshire and the Green Mountains in Vermont. The central region is known especially for The Berkshires in Massachusetts, the Catskill Mountains in New York, the Poconos in Pennsylvania, the Allegheny Mountains that stretch from Pennsylvania to southwestern Virginia, and the nearly parallel Blue Ridge Mountains that run from Pennsylvania to Georgia. The most renowned southern ranges are the Cumberland Plateau and the Great Smoky Mountains. The Adirondack Mountains in northern New York are sometimes considered part of the Appalachian chain but, geologically speaking, are a southern extension of the Laurentian Mountains of Canada. The dissected plateau area, while not actually made up of geological mountains, is popularly called "mountains," especially in eastern Kentucky and West Virginia, and while the ridges are not high, the terrain is extremely rugged. 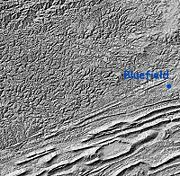 In Ohio and New York, some of the plateau has been glaciated, which has rounded off the sharp ridges and filled the valleys to some extent. The glaciated regions are usually referred to as hill country rather than mountains. The Appalachian region is generally considered the geographical dividing line between the eastern seaboard of the U.S. and the Midwest region of the country. A lengthy section of North America's Eastern Continental Divide follows the Appalachian Mountains from Pennsylvania to Georgia. Before the French and Indian War, the Appalachian Mountains lay on the indeterminate boundary between Britain's colonies along the Atlantic and French areas centered in the Mississippi basin. After the conflict, the Proclamation of 1763 limited settlement for Great Britain's 13 original colonies in North America to east of the summit line of the mountains (except in the northern region where the Great Lakes formed the boundary). This was highly disliked by many colonists and formed one of the grievances that led to the American Revolutionary War. With the formation of the U.S., an important first phase of westward expansion in the late eighteenth and early nineteenth centuries consisted of the migration of European-descended settlers westward across the mountains into the Ohio Valley through the Cumberland Gap and other mountain passes. The Erie Canal, finished in 1825, formed the first route through the Appalachians capable of conducting large amounts of commerce. The Appalachian Trail is a 3,500 kilometer (approx. 2,170 miles) hiking trail that runs all the way north from Mount Katahdin in Maine to Springer Mountain in Georgia, passing over or past a large part of the Appalachian system. The trail is currently protected along more than 99 percent of its course by federal or state ownership of the land or by right-of-way. Annually, more than 4,000 volunteers contribute over 175,000 hours of effort on the trail, an effort coordinated largely by the Appalachian Trail Conservancy organization. In the course of its journey, the trail follows the ridgeline of the Appalachian Mountains, crossing many of its highest peaks, and running, with only a few exceptions, almost continuously through wilderness. The International Appalachian Trail is a 1,100 kilometer (approx. 680 mile) hiking trail into Canada, stretching north from Maine into New Brunswick and Quebec provinces. It is actually a separate trail, not an official extension of the Appalachian Trail. An extension of the International Appalachian Trail, to Newfoundland, is still under construction. The Appalachians have no ranges that reach great heights above the others. In every area the summits rise to rather uniform heights, and none reaches the region of perpetual snow. The highest peaks in Newfoundland rise to about 1,200 meters (approx. 4,000 feet). In Maine, Mount Katahdin rises to 1,600 meters (5,280 feet). Mount Washington, the highest summit in New Hampshire's "Presidential Range," extends above 1,900 meters (6,300 feet). The highest point in Vermont lies above 1,300 meters (4,300 feet); the top elevation in the Catskills is slightly lower. Though mountains run throughout central Pennsylvania, none of them quite reaches 1,000 meters (3,300 feet). 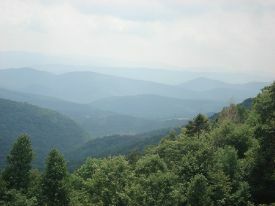 The highest point of the Blue Ridge in Virginia lies above 1,200 m (approx. 4,000 feet), while in West Virginia, more than 150 peaks rise above 1, 200 meters, including Spruce Knob, the highest point in the Allegheny Mountains (about 1,450 meters; 4,800 feet). North Carolina has eight peaks surpassing 1800 m. Mount Mitchell in the Black Mountains is the crown of the whole Appalachian system, reaching an altitude of 2,037 meters (6,684 feet). Clingman's Dome in the Smoky Mountains, on the Tennessee border, is 13 meters (43 feet) shorter. The Appalachian mountain chain also includes plateaus that slope southward to the Atlantic Ocean in New England, southeastward to the border of the eastern coastal plain of the central and southern Atlantic states, and on the northwest, the Allegheny and Cumberland plateaus that incline toward the Great Lakes and the interior plains. In spite of the existence of the Great Appalachian Valley, the master streams run transverse to the axis of the system. The main watershed follows a tortuous course that crosses the mountainous belt just north of the New River in Virginia. South of this point, the rivers head through the Blue Ridge and higher Unaka Mountains, and receive important tributaries from the Great Valley. From there they traverse the Cumberland Plateau in spreading gorges and then escape by way of the Cumberland and Tennessee rivers to the Ohio and Mississippi basins, and thus to the Gulf of Mexico. In the central section, the rivers, rising in or beyond the Valley Ridges, flow through great gorges known as water gaps to the Great Valley, and by southeasterly courses across the Blue Ridge to tidal estuaries penetrating the coastal plain. In the northern section the divides lie on the inland side of the mountainous belt, with the main lines of drainage running from north to south. The Appalachians are very old mountains. A look at rocks exposed in today's mountains reveals elongated belts of folded and thrust faulted marine sedimentary rocks, volcanic rocks, and slivers of ancient ocean floor, which provides strong evidence that these rocks were deformed during tectonic plate collision. The birth of the Appalachian ranges, estimated at 680 million years ago, marks the first of several mountain-building plate collisions that culminated in the construction of the supercontinent Pangaea with the Appalachians near the center. Because North America and Africa were once connected, the Appalachians form part of the same mountain chain as the Atlas Mountains of Morocco and Algeria. During the middle Ordovician Period (about 495-440 million years ago), a change in plate motions set the stage for the first Paleozoic mountain-building event known as the Taconic orogeny in North America. A once-quiet area on the continental shelf changed to a very active plate boundary when a neighboring oceanic plate, the Iapetus, collided with and began sinking beneath the North American continental crust. With the birth of this new subduction zone, the early Appalachians were born. Along the continental margin, volcanoes grew, coincident with the initiation of subduction. Thrust faulting uplifted and warped older sedimentary rock laid down on the former shelf. As mountains rose, erosion began to wear them down. Streams carried rock debris downslope to be deposited in nearby lowlands. 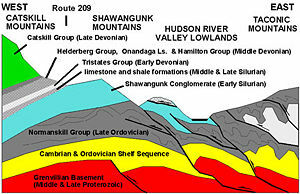 The Taconic orogeny was just the first of a series of mountain-building plate collisions that contributed to the formation of the Appalachians. By the end of the Mesozoic era, the Appalachians had been eroded to an almost flat plain. It was not until the region was uplifted during the Cenozoic Era that the distinctive present topography formed. Uplift rejuvenated the streams, which rapidly responded by cutting downward into the ancient bedrock. Some streams flowed along weak layers that define the folds and faults created many millions of years earlier. Other streams downcut so rapidly that they cut right across the resistant folded rocks of the mountain core, carving canyons across rock layers and geologic structures. 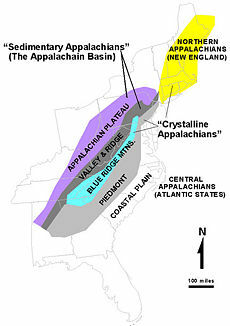 The Appalachian Mountains contain major deposits of anthracite coal as well as bituminous coal. In folded mountains, coal is found in metamorphosed form as anthracite in the Coal Region of northeastern Pennsylvania. The bituminous coal fields of western Pennsylvania, southeastern Ohio, eastern Kentucky, and West Virginia contain the sedimentary form. Some plateaus of the Appalachians contain metallic minerals such as iron and zinc. Much of the region is covered with forests yielding quantities of valuable timber, especially in Canada and northern New England. The most valuable trees for lumber are spruce, white pine, hemlock, juniper, birch, ash, maple, and basswood. Excepting pine and hemlock, as well as poplar, all these woods are used for the manufacture of paper. In the central and southern parts of the belt, oak and hickory constitute valuable hard woods, and certain varieties of the former furnish quantities of tanning bark. The tulip-tree produces a good clear lumber known as white wood or poplar, and is also a source of pulp. In the southern parts on the Appalachians, both white and yellow pine abound. Many flowering and fruit-bearing shrubs of the heath family add to the beauty of the mountainous districts, and rhododendron and kalmia often form impenetrable thickets. Bears, wild cats (lynx), and wolves haunt the more remote vastness of the mountains. Fox and deer abound and are found in many districts, as are moose in the northern reaches. For a century the Appalachians were a barrier to the westward expansion of the British colonies. The continuity of the mountain system, the bewildering multiplicity of its succeeding ridges, the tortuous courses and roughness of its transverse passes, and a heavy forest with dense undergrowth all conspired to hold the settlers on the seaward-sloping plateaus and coastal plains. 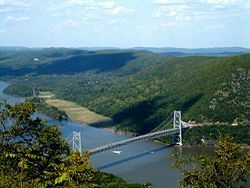 Only by way of the Hudson River and Mohawk valleys, and around the southern end of the mountains were there easy routes to the interior of the country. These were long closed by hostile native tribes, French colonists to the north, and Spanish colonists to the south. In eastern Pennsylvania, the Great Valley of the Susquehanna River was accessible through a broad natural gateway. The Lebanon Valley settled German Moravians, whose descendants even now retain the peculiar patois known as Pennsylvania Dutch. These pioneers were actually latecomers to the New World forced to the frontier to find unclaimed lands. Followed by colonists of both German and Scotch-Irish origin, they worked their way southward and soon occupied all of the Virginia Valley and the upper reaches of the tributaries of the Tennessee. By 1755 the obstacle to westward expansion had been thus reduced by half. Outposts of the British colonists had penetrated the Allegheny and Cumberland plateaus, threatening French monopoly in the intermountain region, and conflict became inevitable. Making a common cause against the French to determine the control of the Ohio valley, the unsuspected strength of the colonists was revealed, and the successful ending of the French and Indian War extended Great Britain's territory to the Mississippi. To this strength the geographic isolation enforced by the Appalachians had been a prime contributor. The confinement of the colonies between an ocean and a mountain wall led to the fullest occupation of the coastal border of the continent, which was possible under existing conditions of agriculture, conducive to a community of purpose, a political and commercial solidarity, which would not otherwise have been developed. As early as 1700 it was possible to ride by horse or stagecoach from Portland, Maine, to southern Virginia, sleeping each night at some comfortable village. In contrast to this complete industrial occupation, the French territory was held by a small and very scattered population, its extent and openness adding materially to the difficulties of a disputed tenure. Bearing the brunt of this contest as they did, the colonies were undergoing preparation for the subsequent struggle with the home government. Unsupported by shipping, the American armies fought toward the sea with the mountains at their back protecting them against Indians leagued with the British. The few settlements beyond the mountains could provide for their own defense by virtue of being precluded from general participation in the conflict due to their geographical position. Before the French and Indian War, the Appalachian Mountains lay on the indeterminate boundary between Britain's colonies along the Atlantic and French areas centered in the Mississippi basin. After the French and Indian War, the Proclamation of 1763 restricted settlement for Great Britain's thirteen original colonies in North America to east of the summit line of the mountains (except in the northern regions where the Great Lakes formed the boundary). Although the line was adjusted several times to take frontier settlements into account and was impossible to enforce as law, it was strongly resented by backcountry settlers throughout the Appalachians. The Proclamation Line can be seen as one of the grievances which led to the American Revolutionary War. Many frontier settlers held that the defeat of the French opened the land west of the mountains to English settlement, only to find settlement barred by the British King's proclamation. The backcountry settlers who fought in the Illinois campaign of George Rogers Clark were motivated to secure their settlement of Kentucky. With the formation of the United States, an important first phase of westward expansion in the late eighteenth century and early nineteenth century consisted of the migration of European-descended settlers westward across the mountains into the Ohio Valley through the Cumberland Gap and other mountain passes. The Erie Canal, finished in 1825, formed the first route through the Appalachians that was capable of large amounts of commerce. This page was last modified on 7 August 2015, at 22:43.